Kelly Blue pulls off a wonderful save as Alton Benn (number 8) fires from close range. and Sport Under-17 School’s Football tournament continued yesterday at Ministry of Education ground after both Saints Stanislaus and St. Georges High, got walkovers from Charlestown Secondary and Dolphin Secondary respectively on the opening day on Wednesday. 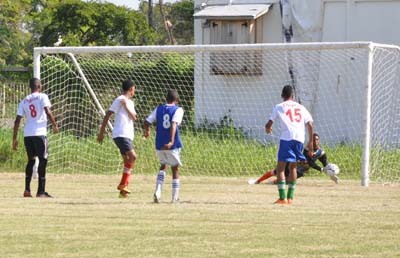 In yesterday’s action, goals on either side of the break propelled Tutorial High to a 2-0 victory over East Ruimveldt in sweltering heat to send the South Georgetown Educational Institution packing from the knockout competition while North Georgetown Secondary also advanced compliments of another walkover from Lodge Secondary. Ironically, it was East Ruimveldt who enjoyed the bulk of possession, especially in the second half, but after doing all the hard work their forwards struggled to finish the job of finding the back of the net and ended on the losing team. Tutorial High, who exhibited a solid defense, opened the scoring in the 21st minute when the crafty Steve Stanton collected a cross and hammered a volley past the East Ruimveldt custodian from just outside the 18 yards box to put Tutorial High ahead. 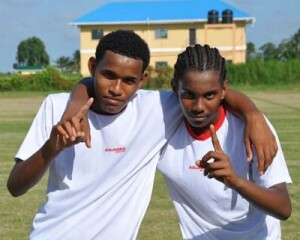 David Coats (left) & Steve Stanton scored the goals yesterday. in the second half and East Ruimveldt had their best opportunity to level the score when Alton Benn dribbled the defense only to see goalkeeper Kelly Blue, who had an outstanding day at the office, bring off a fantastic save, diving to his left to stop the thunderous left-footer from point black range. It was soon 2-0 when David Coats fired from about 16 yards to seal the issue in the 51st minute and this was the last scoring chance for either team. Meanwhile, Deputy Permanent Secretary in the Sports Ministry, Steve Ninvalle, speaking behalf of his Ministry, pledged bigger support from his Ministry for the tournament next year while Kashif Mohammed, Director of the Kashif & Shanghai Organization, thanked the Organization for filling the gap in School’s football. A friendly game between Saints Stanislaus and St. Georges High, which ended 3-0 in favour of George’ Secondary heralded the start of the tournament which saw Ninvalle performing the traditional kick off. The tournament, for schools in the City, is sponsored by Demerara Harbor Bridge, Facials Collection, Albert Cramer, Dev’s Grocery, German’s Restaurant, Nigel Hughes, Pooran brothers, Ross Gas Station, Dynamic Engineering, Medicine Chest, Juice Power, GFF, Talk is Cheap Internet café, Onzie People’s Choice Barber Shop of New York, Star Party Rentals, the Ministry of Culture and the Education Ministry. The final of the 16-team tournament is scheduled for Sunday December 21. The Champions will collect $200, 000, the runners up $150,000, the third placed team walks away with $100,000 and the team finishing fourth gets $75, 000. The competition continues today with Bishop’s High facing-off with Queens College from 13:00hrs and Tucville Secondary battling North Ruimveldt Multilateral from 15:00hrs. Both games are fixed for the Ministry of Education ground, Carifesta Avenue.